Animal health workers in Botswana develop a seasonal calendar to analyze the seasonal occurrence of key livestock diseases in relation to other seasonal factors such as rainfall, presence of vectors and availability of pasture (photo credit: ILRI). 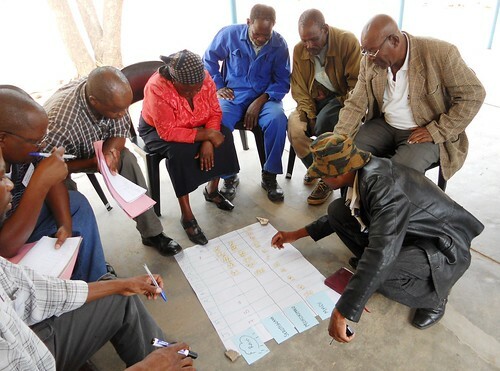 Twenty animal health workers from Chobe, Central District and South-East District in Botswana benefited from a week-long introductory training course in participatory epidemiology that was held at Serowe, Central District, Botswana on 19 – 24 November 2012. The objective of the training course was to equip the participants with basic knowledge of epidemiology, disease surveillance and participatory epidemiology and introduce them to some of the tools used to carry out participatory epidemiology. Although some of the participants had previous training and experience in epidemiology and surveillance, none had training or experience in participatory approaches thus the course was very useful in imparting new skills for livestock disease investigation. Participatory epidemiology goes beyond the conventional quantitative methods of standard veterinary disease investigations and considers the social context of disease transmission. It uses participatory approaches and methods to improve our understanding of the emergence and spread of diseases in populations and relies on existing veterinary knowledge and qualitative inquiry to complement quantitative data collection and analysis. Saskia Hendrickx, a veterinary epidemiologist at the International Livestock Research Institute (ILRI) based in Mozambique, facilitated the training course. In addition to the theory sessions, there were three field visits to livestock keepers in nearby villages during which teams of 4-5 participants carried out semi-structured interviews and used some of the participatory epidemiology tools. The teams later met to share their feedback of the field visits with respect to what worked well and what did not in order to improve in future. On the final day of the training course, the participants developed work plans for the following three months to carry out key informant interviews in selected villages. The teams will carry out at least 20 interviews in villages where smallholders are present and/or where there are many small ruminants. Also targeted are areas where there have been recent deaths of cattle or where small stock died and the deaths were not properly investigated. The participants generally agreed that the training met their expectations and that the knowledge gained would be useful for their daily work. All of them said they would be able to train others on what they had learnt. 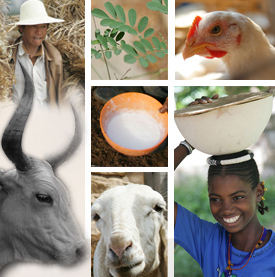 Tags: animal diseases, animal health, capacity strengthening, participatory epidemiology. Bookmark the permalink.